:: What is an Education Visa ? On acceptance by Sirada -The Learning Centre you will be able to get a "Non-Immigrant ED" visa from a Thai Embassy or Consulate abroad. This visa will allow you to stay in Thailand for 1 year subject to an extension every 90 days. Basically this means you can stay in Thailand for one full year without any visa runs whatsoever, after the extension has been made. Ninety days address reports to the Immigration Office still have to be made the same way as with any other stay extension. :: How to Apply for an Education Visa ? If you are in Thailand now you will need to contact us by email or visit our office for paperwork to take to a Thai Consulate when you next depart Thailand. . Suggest nearby Consulates in Penang, Malaysia or Vientiane, Laos or Savannakhet, Laos. If not in Thailand at present but wish to come to Thailand in order to learn Thai or English, we can send all the paperwork to you at your overseas location. On receipt of your application and fee we will send a request to the Thai Ministry of Education for a letter of acceptance stating that they will allow you to take a one year course with Sirada - The Learning Centre. This takes about 3 weeks**. After this letter has been issued you can take the letter with other necessary documents to one of the Thai Consulates overseas. Be sure to request from the Thai Consulate a Single Entry ED Visa. If you obtain a Multiple Entry ED Visa, you will have to leave and re-enter Thailand every 90 days. Go to: www.thaiembassy.org for a list of Thai Consulates. The letter of acceptance will be send to you by the best speediest and safest method possible via FedEx/DHL/EMS. This will be at your expense and payable to the school on arrival here. :: What Happens After I Get The Visa ? After obtaining your non-immigrant ED Visa, the immigration officer at your point of entry will permit you to stay for 90 days. Then, with paperwork provided by Sirada -The Learning Centre, you will be able to extend your stay every 90 days at the local immigration office. After you make your entry on this visa and if you should wish to depart Thailand for a brief visit to another country, go to your local Thai Immigration Office and request a Re-Entry Permit. Option A: Baht 10,000 I year Visa. Includes all documentation plus 40 hours of tuition. Additional tuition Baht 3,100/20 hours. Option B: Baht 24,900 I year Visa. Includes all documentation plus 160 hours of tuition. Additional tuition Baht 3,100/20 hours. 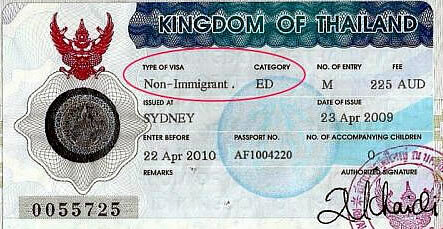 :: Do You Guarantee the Issue of the ED Visa? There are no guarantees in this World. However, our school is recognized by the Thai Ministry of Education as providing education to international students and promoting Thai language and culture. Should your visa be refused for any reason, we will make a full refund of monies paid less an Administration Fee of Baht 1,000 (we are happy to say as at this time we have never had to make a refund). :: How Many years can I Study at Your School? At this time there is no maximum period. However, at the end of each year, you have to leave Thailand and get a new visa at a Thai Consulate. We will provide free documents for you to take to the Consulate. Suggest nearby Consulates at Penang, Malaysia or Vientiane, Laos or Savannakhet, Laos. Travel details are available from our office. Nationals from India, China, Pakistan and Middle-East Countries need to go to their home country to apply for the Ed visa. We will have the documents issued for you to take to your local Thai Consulate. ** Processing by the Education Department normally takes 1 week. If your present stay date is less than 10 days, it will need to be processed on an express basis, which incurs additional costs (using Courier Service). We may charge a fee of Baht 2,000 to have such applications processed.